« Poll: Who Wins Thursdays Night Battle – Saints or Falcons? The Falcons have lost just one game in the 2012 season to date, and Thursday night they get a shot to get revenge on that team, as they play host to the rival New Orleans Saints at the Georgia Dome. The 10-1 Falcons are 5-0 at home, and while there’s been some close games, they have always been able to find a way to escape without a loss. That is other than the week 10 battle when they lost in New Orleans 31-27. That day the Falcons had a shot to win it late, as they were on the one-yard line in the last two minutes with four shots, but couldn’t get it done, sending them to their first loss of 2012. The Saints have had the Falcons number, as Atlanta coach Mike Smith is 2-7 against the Saints and 49-15 against the rest of the NFL in his four-plus regular seasons as Atlanta’s coach. It’s a huge game for both teams, as the Saints, losers at home to the 49ers Sunday 31-21, need a win to try and stay in the wild card race in the NFC at 5-6. The Falcons at 10-1 want to make sure to stay in the one-seed in the NFC, and if they win out, then the NFC will run through the Georgia Dome. 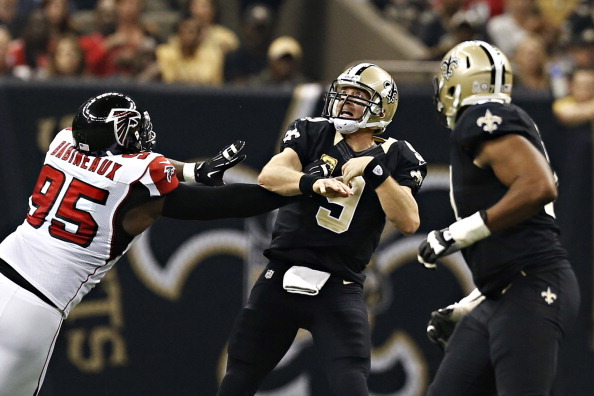 It will take a huge effort by Matt Ryan, who threw for 411 yards in the last game vs the Saints, to get the job done. Ryan has been a bit up and down in recent weeks, while putting up good numbers, there’s times in a game where the Atlanta offense seems to go to sleep. The Saints on defense have to find a way to keep Michael Turner in check, and if they can do that, they can focus in on Ryan, and try and put pressure on him and try to get turnovers. Ryan has thrown 21 TD’s to date in 2012, but also has 13 interceptions, which already is more than the 12 he threw in 16 games in the 2011 season. The Saints will need turnovers to shorten the field and give their QB, Drew Brees, a better shot to put up points. Last time the teams met, the Saints put up 31 points, and they made need to do that again if they are going to get the sweep over the Falcons. You can bet that Smith is going to get a scheme together to try and keep Brees in check, and also TE Jimmy Graham, who last time out caught seven passes for a career-best 146 yards and two touchdowns. Atlanta wants to prove something here, and I think they will do enough at home to send the Saints packing, and with seven losses, it could be over in terms of playoff aspirations for New Orleans.